HODIE 3a vice lecta est Billa, declaring the Compassing or Imagining of the Death of the Queen's Husband to be Treason, que commissa est ad ingrossandum. Eodem die, 3a vice lecta est Billa, for the Reformation of Apparel. Eodem die, 1a vice lecta est Billa, for the reducing of the Office and Name of Great Master of the King's House into the Name of Lord Stewarde, que commissa est ad ingrossandum. 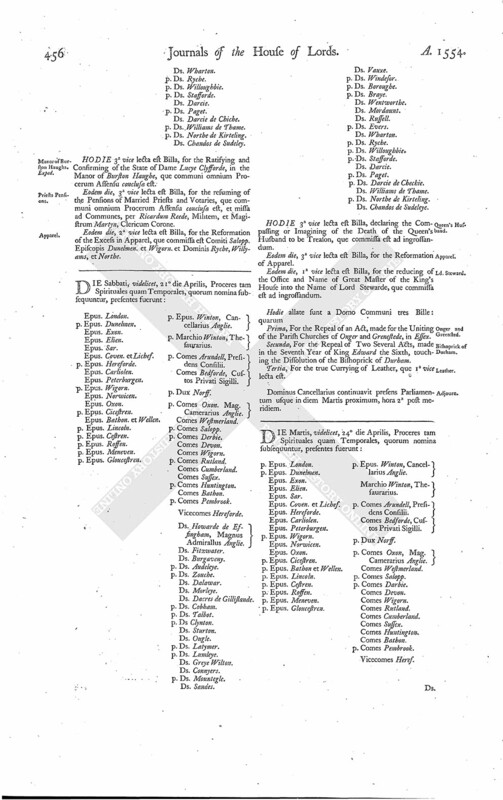 Prima, For the Repeal of an Act, made for the Uniting of the Parish Churches of Onger and Grenestede, in Essex. Secunda, For the Repeal of Two Several Acts, made in the Seventh Year of King Edward the Sixth, touching the Dissolution of the Bishoprick of Durham. Tertia, For the true Currying of Leather, que 1a vice lecta est. Dominus Cancellarius continuavit presens Parliamentum usque in diem Martis proximum, hora 2a post meridiem.